Nobody is a born natural history photographer; it is something that has to be worked hard at and I firmly believe that the more you know about nature, the better the photographer you will become. Many people ask me which is the best camera to use for nature photography. Well, the best is the one that suits your personal requirements. If you specialize in flower photography or do a lot of studio work, then you may do well to buy a medium-format such as a Hasselblad, Bronica or Mamiya. These cameras produce 6 x 4.5 cm or 6 x 6 cm negatives depending on the particular model, but all are expensive. Lenses for such cameras are also very pricey so you must decide whether such expense is going to be justified. Perhaps the most common nature photography camera is the 35 mm SLR (single lens reflex). I use an Olympus OM1 and OM2 because they are relatively cheap, have a multitude of accessories, and are fairly lightweight, which is worth remembering when you are walking around in the field all day. I am often shown photographs by people who think their work is excellent, and it is difficult to point out deficiencies without causing offence. A nature photographer has to be very self-critical. Most pictures I see suffer from faults contained in one or more of the following critical areas: depth of field, exposure, composition or image size. With regard to this last one, I mean a crested lark looking like an ant photographed at 100 feet. So let’s go back to basics for a while. A picture is made up of dots called grain; the larger the dots, the grainier the picture, and vice versa. Films such as Kodachrome 64 ASA (American Standards Association), Fujichrome 50 ASA, and Kodachrome 25 ASA are all examples of fine grain films, whereas Ektachrome 400 ASA is a coarse grain film. It is a good idea to try to get used to one make of film; the more you use it, the more you will learn about its characteristics, and you will begin to appreciate slight color differences between films. We all see colors differently, and what suits one person does not necessarily suit another. I have been using Kodachrome 65 ASA for about 20 years because if its superb color saturation and fine grain. It also reproduces remarkably well in magazines. To get the deep rich colors I want, I rate the film at 80 ASA by setting the ASA dial on the camera body to 80. This in effect under exposes the film by about one third of a stop. Do not take my practice as law but experiment yourself to see what suits you. The ASA rating also tells you something else about a film that is its sensitivity to light. It takes longer to form an image on a 25 ASA film than on a 1 000 ASA-rated one. When photographing in subdued light, a fast film may be required but here in the Middle East where daylight is invariably bright, you should be able to take the majority of pictures on 64 or 100 ASA film. Shops are now awash with automatic cameras boasting auto-focus, auto-exposure, auto-wind etc. I have nothing against such cameras. If they get people out of their armchairs, away from television and interested in photography, then there must be some good in them. However, I prefer to tell the camera what to do, and not have it dictate to me. So many people do not know what the aperture or shutter speeds are for. Around the barrel of a lens you will find a sequence of numbers, often as follows: 2, 2.8, 4, 5.6, 8, 11, 16, 22. These are ‘f’ numbers, or stops, which relate to the size of the aperture in the lens diaphragm and which control the amount of light entering the lens to give an image on the film. 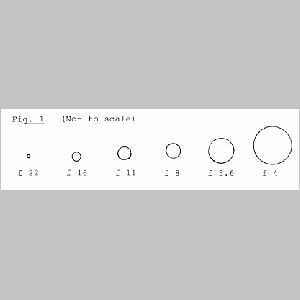 The smaller the number, the larger the aperture, and vice versa (see Fig. 1). If you “open up” one stop it means that you are allowing more light to enter, e.g. by turning the aperture ring from f16 to f11, or from f8 to f5.6. If you close down one stop you effectively decrease the amount of light entering the lens, e.g. from f8 to f11. There is a definite relationship between these numbers. Each number moving up the scale lets in half as much light as the previous one; so f8 lets in half as much light as f5.6, and f11 half as much as f8, and so on. The aperture has a direct bearing on depth of field, that is the area in front of and behind the point of focus that is rendered sharp. A large aperture such as f2 gives a shallow depth of field, while a smaller aperture like f16 or f22 gives a much larger depth of field. This is due to circles of light on the film plane that are known as circles of confusion, formed by light from different areas on the subjects being photographed. Also on the camera body you will find shutter speeds, e.g. a sequence of 1 second, ½, ¼, 1/8, 1/16, 1/30, 1/60, 1/125, 1/250, 1/500, 1/100 of a second. As you can see, moving up the scale each number is half the length of time of its predecessor, i.e. 1/8 second is twice as fast as ¼ second, or 1/500 twice as fast as 1/250 of a second. So, by adjusting f-stops and speed settings against each other, the same amount of light can be permitted to fall onto the film. 1/250 second at f8 lets in exactly the same amount of light as 1/500 second at f5.6, which lets in the same amount of light as 1/125 second at f11. All this may seem a little complicated at first but becoming familiar with camera settings and dials is a prerequisite for any genuine photographer, and they can all be used to your advantage. If you wish to photograph a bush and get the whole of it sharp and in focus, you select a small aperture such as f11 or smaller. If you wish to isolate a single flower or small section of the plant, you can use a larger aperture such as f2.8, 4 or 5.6, which will ensure an out of focus background. It is quite simple to decide what your depth of field will be. Around the barrel of the lens you will see something familiar to Fig. 2 (which in fact is taken from a Zuiko 35mm f2 wide angle lens). If the aperture is set at f4 and focused on an object, say eight feet away, the depth of field will range from 6.41 to 10.66 feet. If the aperture is set to f16 and focused on the same object eight feet away, then the depth of field will be 4.05 feet to infinity. On my now rather old camera lenses there is in my opinion an essential item, and that is a depth of field preview aperture you have set and you can instantly see through the viewfinder what the depth of field is for that aperture. You release the button prior to pressing the shutter release. So there should be no excuse for photographs displaying poor depth of field if that is what is required. Sometimes, to be able to select f22 you may be down to ¼ or even ½ second shutter speed but this should be no problem if you have a sturdy tripod and cable release. Do not be misled into buying a cheap, flimsy tripod if you are serious about your photography. Such a tripod cannot cope with giving effective support to a bulky 600 mm lens, a must for bird photographers. But the sturdiest tripod you can afford and make sure it can be used a ground level. Some tripod manufacturers suggest that if you want to get really low, reverse the central column and fit the camera upside down between the legs. I do not find this satisfactory at all, as that third leg always seems to get in the way. Kennett make an excellent tripod called a ‘Benbo’. This is well engineered and the legs can be splayed out to facilitate ground level photography. 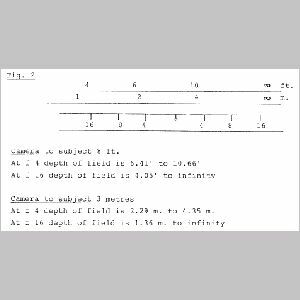 Most modern cameras have TTL (through the lens) metering and measure the light reflected from the subject. Unfortunately, cameras are inanimate objects and cannot think for themselves, so they tend to ‘see’ everything as a mid tone, i.e. 18% gray. If you are photographing an 18% gray caterpillar against an 18% gray wall you will get a perfectly exposed picture. In reality, of course, this never happens. Try to photograph a white flower against a background of beach sand, or a black animal at night and you will see what I mean. Your pictures will turn out gray. To prove this point, take three pieces of card, one black, one white and one 18% gray. Take a picture of each and they will all turn out grayish, since the camera is designed to do this. Here in the Abu Dhabi desert, a bright sun playing on bright colored sand means that you must treat dunes almost as if they are snow. Switch your camera to manual and take a reading. Suppose it is 1/250 second at f11. Now, deliberately overexpose by one stop, i.e. set the reading to 1/250 second at f8, or 1/125 at f11. Another way to do this is to set the exposure compensation dial to one stop over, or reset the ASA dial in the same way. For example, if you are using a 100 ASA film, reset the dial to 50 ASA (but remember to put it back to 100 ASA after taking the photograph). You can also take a reading off an 18% gray card. These are cheap and can be bought in most good photography shops. Perhaps the best way to achieve accurate exposure is to invest in a separate hand held exposure meter. To me, this is an essential piece of equipment. Not only does it measure reflective light but it also has an opaque cover that can be slipped over the light sensor to measure incidental light. This is the light falling on to the subject rather than being reflected from it, and really accurate readings can be obtained. Modern sophisticated cameras often have multi-pattern and spot metering but they still measure reflective, and not incidental, light. One of the most difficult natural history subjects to photograph successfully is a white flower. The picture all too often turns out over-exposed and burnt out. The answer is to take a reflective reading and then under-expose by at least one stop, or to take an incident reading by using the hand held light meter to measure light from the subject facing back to the camera. So many potentially good pictures are spoilt because the subject is in the wrong position in the frame. A starting point for composition is the rule of thirds. 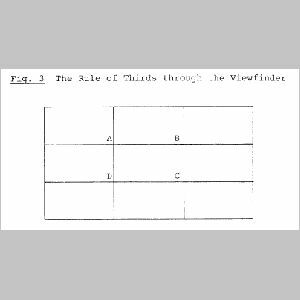 In your mind’s eye, divide the viewfinder into thirds, horizontally and vertically (Figure 3). When composing a photograph, try putting the subject in one of the intersections A, B, C or D, and not right in the middle of the viewfinder. 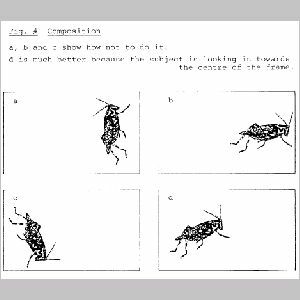 Also, try to have your subject looking into or facing the center of the frame and not out of it (Figure 4). When photographing single stems of flowers such as orchids, or small creatures such as lizards, put them slightly off-center and try to show something of the habitat, too. A low-down wide-angle view is often successful because it shows the subject sometimes partially silhouetted and therefore standing out clearly from the surrounding area, and with a wide-angle lens set to a small aperture you can get excellent depth of field. Of course, this is not always possible if there is a mass of vegetation surrounding the subject. In such a case, consider all possibilities and angles before pressing the shutter release. Walk around the subject and consider it critically. After all, if a picture is worth a thousand words, then make sure it tells a story. Many photographs are spoilt because the image on the negative or slide is too small. It does not have to fill the frame entirely, but you should at least be able to identify the subject. A long telephoto lens is essential for bird photography, such as something between 300 and 600 mm. Always buy the best lens that you can afford for the job. Some independent makes of lens are good but the old saying “you get what you pay for” rings true, and in general with photography, the more you pay, the better the optics will be. Here in the UAE we can depend on bright light for a good 10 months of the year so you should get decent light readings with a 600 mm f8 or 300 mm f4.5 lens. These are termed ‘slow’ lenses as the maximum aperture of f8 or f4.5 does not let in too much light. In the past couple of years, ‘faster’ lenses such as the Olympus Zuiko 350 mm f2.8 and the Nikon 600 mm f4 lenses have come to the market. The light-gathering capability of such lenses is incredible but they are heavy and very expensive. If you are thinking of buying a camera specifically to use here in the Middle East, give some thought before buying. The UAE gets very hot in summer, often with a very high humidity factor. Such conditions can play havoc with a camera battery and cause it to give unreliable light readings or, worse still, malfunction completely. Modern auto-focus, auto-wind, auto-exposure cameras are rendered completely useless if the battery fails – something to consider if you are on a one-off trip to the mountains or to an area you are unlikely to return to. This is one of the main reasons why I use an Olympus OM1. It has a mechanical shutter so does not require a battery to operate. A hand-held light meter can compensate for the automatic meter in the camera if necessary, especially one that works by a selenium cell. If the worst comes to the worst, you can always use the sunny f16 rule. This states that no matter where you are in the world, on a bright clear day two hours after sunrise and two hours before sunset, when reading off a mid-tone subject larger than a bread bin, the aperture will be f16 for the shutter speed nearest to the ASA of the film you are using. For example, if you have Kodachrome 25 ASA in your camera, the reading will be 1/30 second at f16. Of course, you can always bracket your exposure by taking a picture one stop over and one stop under, just to be safe. Subjects such as butterflies and dragonflies are very difficult to photograph. Some people capture butterflies and refrigerate them to immobilize them, and then photograph the creatures in whatever setting they choose. I personally abhor and do not endorse such practice. If you cannot photography a butterfly or dragonfly in its native state in the wild, you should not continue with such subjects. Insects are cold-blooded so at night their temperature drops and they often become lethargic and torpid. In the early morning they may be found peacefully resting in sunlight to warm up and this is usually the best time to photograph them. Some of the insects are very small and demand the use of a macro or close-up lens in order to get near enough for the subject to fill the frame. A true macro lens is one that gives a magnification ration of 1:1, i.e. life size. This means that if a damselfly measures, say, 30 x 22 mm the image size on the slide or negative will also be 30 x 22 mm. Most macro lenses advertised are in fact close-up lenses and give a magnification ratio of just half this size (1:2) or even less. When using a close-up lens you must remember that the greater the magnification, the shallower the depth of field. My 90 mm close-up lens set to f16 at half-life size gives me approximately 12 mm depth of field. Obviously it is pointless trying to photograph a damselfly or butterfly head on. All you will succeed in doing is getting the head in focus and the rest of the body will be blurred. It is best to photograph such insects from the side with wings closed or from above with wings opened out, and then depth of field is not such a problem. Try to ensure that the back of the camera i.e. the film plane is parallel to the wings. If the camera is tilted slightly off a parallel plane, you will probably end up with at least some of the wings out of focus. Another good idea with insect photography is to pre-focus to say 1:2 or 1:3 magnification. You can then keep both hands firmly on the camera and bring the insects into focus by moving your body backwards and forwards. An old tip when photographing butterflies and similar insects is to put a little sugar and water mixture onto a flower, which will keep the insect occupied and fairly still. The best time of day for desert photography is undoubtedly the early morning, from sunrise till 10 a.m. as the sun is low in the sky, soft and with an orange glow. By late morning, the sun is high and the light harsh. Later afternoon sees softer light again, but usually there is a lot more haze and sand particles in the air to worry about. If you are taking pictures that include the sky, don’t forget to keep a polarizing filter over the lens. This not only deepens the blue but also protects your lens. Remember to use this filter at 90 degrees to the sun for best results. When photographing a subject in the early morning, one side will be in shadow. This can be remedied if desired by using a reflector. All you need is a piece of strong cardboard 12” x 9” and some baking foil. Lightly crumple the foil, then smooth it out and stick it over the card. If you don’t crumple it, the light reflected will be too harsh. You can then position this reflector wherever you wish to throw some light back into the subject and give a more even illumination. This is particularly useful for flower photography. Another hand-made gadget I carry around with my photographic gear is a small material bag that is filled with dried beans to act as a lens support. When in the desert I empty the beans out and fill the bag with silica-gel crystals; it now doubles as a rest and a moisture absorber. Above all in the desert, keep dust and sand away from your camera by keeping all equipment not in use in sealed plastic bags. I sometimes keep my camera inside three or four bags, each sealed. It is surprising how far sand and dust can penetrate.